Army researchers have developed an application that helps unit leaders better predict the likelihood of heat illness for both training and operations. 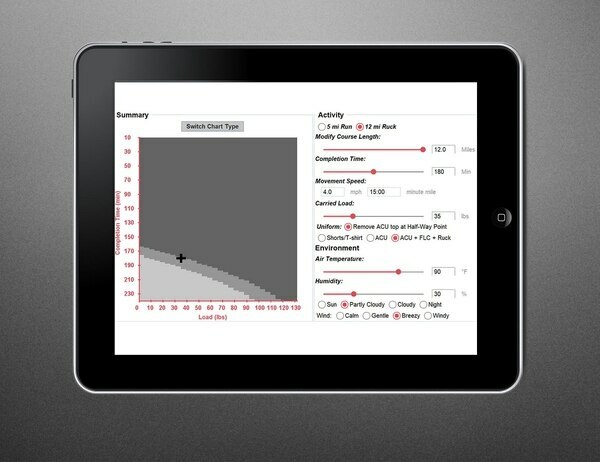 The Heat Strain Decision Aid is an app for both computers and tablets that conducts simulations of heat stress so that planners can effectively set out time tables that allow soldiers to work while also protecting them from overexertion, which can lead to debilitating, even deadly heat-related conditions, according to a release. The long-held standard of flag conditions using wet-bulb globe temperature readings that set work allowed across a base or location can help prevent heat casualties, but it can also be overly broad and not totally factor in details of the work being done or equipment used. And heat illnesses can occur for factors beyond weather conditions. The HSDA tool uses equations to predict how body core temperature changes during and after training. It includes such variables as clothing, activity and environment that affect core body temperature. That helps leaders best tailor activities under Army heat illness and hydration guidance. They can adjust the activities and gear to best accommodate the restrictions while still accomplishing necessary tasks. Or, be best prepared for instances when more heat injuries could occur. The application is pulling together more than three decades of research by USARIEM and others into heat illness, hydration and body core temperature. Researchers used the Natick Soldier Systems Center in Doriot Climactic Chambers, a lab that can recreate conditions from desert to Arctic temperature ranges. Both the Army’s 1st Special Warfare Training Group and the Air Force’s 352nd Battlefield Airmen Training Squadron are using the app for training sessions.